My View on Health Testing... I am an open book when it comes to health testing. No breeder has perfectly healthy dogs. It's impossible... Some breeders prefer not to expose the problems they may or may not have in their line of dogs, that they have bred or acquired. I believe the only way to improve the breed is to share this information, as to not "double up" on anything... including allergies. The Orthopedic Foundation for Animals (OFA) is NOT the end all to be all. If you do not see something posted on OFA for one of my dogs.... contact me and I will provide you the information. I believe OFA has very good intentions, but also think there are a lot of holes in their system.... for example... a dog with waxing and waning Thyroid TgAA should NOT have a normal result. They should be equivocal at best. Also, dogs who are being medicated should not be allowed to post normal results in the thyroid database. What does "breeding for health" really mean? ALL Reputable/Ethical breeders test their breeding stock for heritable diseases period. The goal of completing health testing is to greatly reduce the inheritance of genetic disorders. A prospective breeder should be able to provide you with the results of all health tests upon your inquiry. If you do not receive results from the testing, or if the "breeder" says their dogs have all been tested but cannot provide documentation or proof, that should send up a red flag. Do not walk..... run in the other direction. Degenerative Myelopathy or 'DM' as it is usually referred to, is a fast moving disease that is auto-immune in nature. There is no cure and no preventive. The ONLY way to prevent it is through responsible breeding. Onset of DM is usually at a later age, however in some dogs it has been seen as early as 5 years of age. I believe breeding dogs, who are "At Risk" for the disease is too risky. This may be a controversial subject for some, but until there is more information proving greater detail about this disease, this is where I stand. DM starts with notable rear end weakness noticed in uneven wearing of the rear toenails, slipping, foot dragging and progresses to a further debilitating state. The dog will progress to needing help walking and standing. It eventually causes loss of bladder and bowel control and the dog becomes completely paralyzed in the rear. If the dog lives long enough, it can move into the front limbs as well. Fortunately it is painless, but is still mentally taxing to the dogs and their dignity. It is emotionally draining and scary for the humans who must care for the animal. As the disease progresses, the animal eventually becomes unable to walk under it's own power and is totally dependent on humans for getting around. For the test, OFA requires you to collect DNA from your dog and send it in. It is a very simple cheek swab, and the cost is around $65. I highly recommend any owner who does not know the pedigree of their Ridgeback, or if parents that have not been tested, to test their dog for DM. If the disease appears, you at least have an idea of what to expect. The only way to completely diagnose DM is via necropsy after the animal is deceased, however through elimination testing you can rule out other ailments. 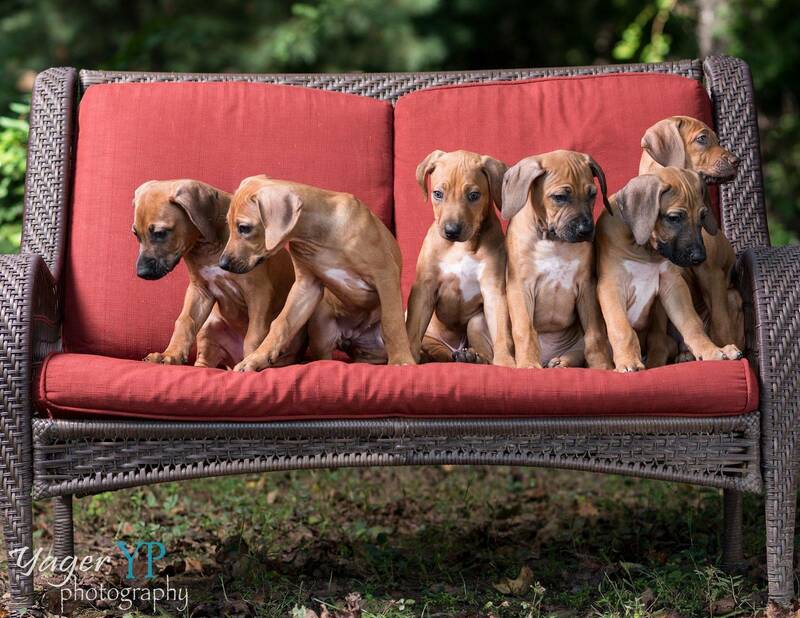 Please click below for an excellent presentation put together by Lauren Meadows of Benelluka Rhodesian Ridgebacks, Ontario, Canada. The slide show includes links to you tube videos so you can see what the progression of the disease actually looks like. A blood test is done by the vet and sent to a reputable agency to determine if the dog is free of thyroid disease. The test that is done MUST show the full thyroid panel, and not just parts of it. Only then can we make the determination if the dog's results truly are in need of further research and possibly starting the animal on medication. I PREFER the test be sent to MSU or to Dr. Jean Dodds DVM of Hemopet in Salinas, CA. They both are familiar with sighthounds, and I believe they do a much better job than OFA's labs do, and would like to see Thyroid testing NOT be done through the OFA, or Antech Labs. Thyroid disease has plagued Ridgebacks for years. Of the 103 OFA Thyroid tested breeds, Ridgebacks are currently in the top fifteen for Thyroid disease incidence. Nearly 10% of all Ridgebacks tested are showing Autoimmune Thyroiditis while 13% are showing to be "Equivocal". Considering the lower popularity of the Ridgeback, this does not bode well. A dog that is showing early signs of the disease, or is showing numbers starting to go off (fluctuating between normal and equivocal), should not be put into a breeding program under any circumstance. Unfortunately it is possible to post a false negative result to OFA. This means medicating a dog who is at risk, running the blood panel to check for correct levels, then posting the test. This is easily done, and is dishonest. This is another reason why I do not trust OFA for Thyroid testing. Because Thyroid disease is so prevalent in the breed, I consider this an extremely important test. Unfortunately the parent breed club does not make this a requirement for breeding dogs. I believe it should be part of the RRCUS code of ethics, that no dog with a rising/waxing and waning TgAA level (the genetic component) should be bred, and should be eliminated from the gene pool by spaying or neutering. Dogs who have been diagnosed with Thyroid disease should not be put into a breeding program. Before breeding I will ensure the entire Thyroid panel is evaluated, including TgAA levels. OFA: Orthopedic Foundation for Animals. http://www.offa.org/ Hips & Elbows are x-rayed by a certified veterinarian, and sent into OFA. They are reviewed by experts for signs of hip dysplaysia & Elbow Displaysia & then given a score. Dogs must be 24 months to receive a score. Dogs less than 24 months can be x-rayed for preliminary results only. Hip dysplaysia effects many large breed dogs. Dogs who have been diagnosed, require expensive surgery to attempt to correct the problem, and may require more than one surgery. Acceptable hip scores for breeding are Excellent, good and fair. A word on elbows... The OFA procedure for evaluating elbows has been unchanged since they first began issuing elbow clearances in 1990. So... for more than 25 years, with all of the medical advances we now have, they have not changed their process of evaluation. I personally feel as though this is a problem. The elbow joint is very complex and it cannot be determined by a single flat x-ray whether the joint has minor arthritic changes or is truly at the beginning stages of Dysplasia. There is some controversy in the Ridgeback breed, in regards to OFA and Grade 1 elbows. Some breeders say that the OFA single flexed x-ray is not enough, or is a poor indicator of what is happening inside the complex elbow joint. The x-ray does not definitively show the inside of the joint. OFA issues a Grade 1 score when there are "secondary" indications that primary lesions exist. What this means is that the elbow could very well be normal, but is issued a Grade 1, based on minor arthritic changes outside of the joint. Several countries use at least three films to determine elbow scores. There was an article in the Ridgeback Register a few years ago in regard to this. Several RRCUS breeders have bred an OFA Grade 1 elbow with success; that is, subsequent offspring have not been affected, nor have produced a Grade 2 or higher elbow. Many breeders consider the Grade 1 decision as "equivocal", meaning that the result should be further investigated. Other measures to determine the status of an elbow besides x-ray include Arthroscopy and CT. The gold standard for looking inside the elbow joint is Arthroscopy. When an arthroscopic exam or CT is used, it can determine without a doubt whether a grade 1 elbow is truly dysplastic or if there are just minor arthritic changes with no evidence of dysplasia. OFA registers dogs who are free of heritable eye disease. The dog must be examined by a veterinary ophthalmologist at least annually. When the dog is certified, the information gets forwarded onto OFA and submitted into their database. See the CERF website for a list of approved veterinarians. The dog must be be examined by a certified veterinarian or canine cardiologist in accordance with procedures outlined in the OFA Application and General Instructions. The information is then recorded in the OFA database. To be listed in the database your dog must be free of all cardiac abnormalities. A DNA sample is taken and sent into project dog to test for Early Onset Adult Deafness (EOAD).